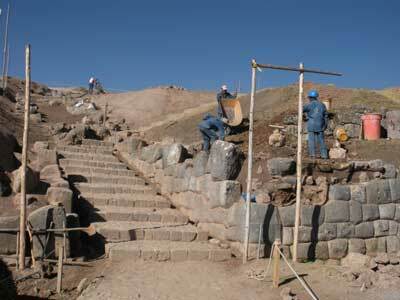 Peruvian authorities in charge of archaeological sites seem to have a voracious appetite to ‘rebuild’ the Inca ruins. They seem to think that the ruins need to be ‘reconstructed’ in order for them to become worth something more – ‘puesta en valor’ as the signs tell us. The ruins in themselves are just not enough. As we explored the ruins,we realized just how much had been ‘reconstructed’ and continues to be. At Macchu Pichu for example, you can’t even see the ‘most beautiful wall in the world’ (as described by Hiram Bingham) as it is currently under ‘reconstruction’ and the area is only open to workers carrying bags of cement. It felt strange to watch the ‘ruins’ being rebuilt and made to look ‘tidy and new’. Peter Frost raises this issue in his book ‘ Exploring Cusco’ hoping to ignite some discussion as he argues that there has never been a debate in Peru about this. No one has ever questioned the authorities. 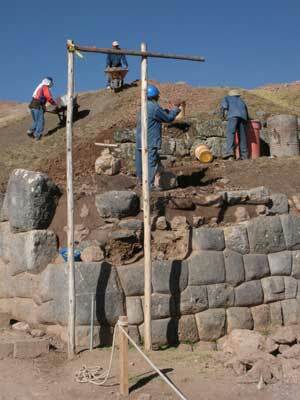 And so the rebuilding of the old ruins – ‘The Treatment’ as Frost describes it, continues unimpeded. I have to admit that on one hand there is something nice about seeing the ruins ‘new and rebuilt’ like the beautiful, big terraces at Moray for example. However, I agree with Frost that this theme park approach takes away the ‘mystery, allure and enchantment’ that only our own imaginations can add to the experience of being there at these intriguing and mystical ruins. This entry was posted on 26/08/2009 at 18:33 and is filed under Archeology, Books, Conservation, Environment, Peru, Quotes, South America, Sustainable Travel. You can follow any responses to this entry through the RSS 2.0 feed. You can leave a response, or trackback from your own site. Ever see the ruins of Pompei? Its in even more ruin now. The famous Colosseum? Marred by a metal scaffolding spanning an immense amount of decay and weeds. Why not rebuild it to its splendor and preserve these sites?! Imagine the Giza Sphinx suddenly losing its entire head as it collapses to the ground. Will they just leave it there? How much more beautiful will the plateau be if the pyramids were restored with their original white casing stones and gold cap? Uncovering an ancient ruin only to let it decay in the elements is as immature as the barbarians who destroyed it the first place. Either restore it to its prime ……. or re-bury it. Interesting thought! Nevertheless, in this case, we feel it indeed takes on more of a Disneyland feel rather than an archeological site. Especially at Machu Picchu, the can never replicate the work of the Incas, so it mars the scene in our opinion…but thanks for your comment..a reply? I’ve wanted to visit Machu Picchu my entire life, and finally have the funds and time to do so. I have always savored ruins that have been uncovered, but are otherwise untouched. It grieves me that this major treasure of human history has been desecrated by the modern compulsion to reinvent and repurpose history for profit. Even China is cleaning up the past for tourism. Cuzco is no longer my destination, but I wonder what might be?